TO PRESIDENTS OF CONFERENCES OR BRANCHES. N.B.—Licences will be forwarded to the written order of a President of a Conference only. Certificats to the written order of the President a Branch or Conference only. Terms, Invariably, Cash, including expenses of carriage ?? ?? ?, to accompany the order. Perhaps this ad is mundane, simply a necessary element of running an organization like a church. But I’m not convinced that any element can be truly unimportant, given the relative lack of information about this time in Mormonism in New York City. Some of the things mentioned in this ad I believe I understand. Others I’m not so sure. Mormon visitors to New York City in the 1870s mention most frequently two individuals in the New York City region, if they mention anyone at all. 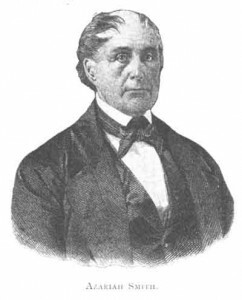 Williams C. Staines was the emigration agent, the missionary sent from Salt Lake City to assist the emigrants from Europe through customs and through the transfer from ship to train. 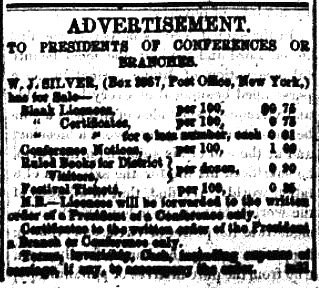 In contrast Henry G. Bywater, the Brooklyn Branch President, hadn’t come from Utah and didn’t visit there frequently. He lived permanently in Brooklyn while trying to earn a living and get his family to Utah. When Staines was not around, everyone went to Bywater for advice and assistance. It is unusual these days for LDS congregations in Manhattan to experience death. Members of the Church here are generally young, and longtime members often move away by the time they arrive at retirement age—so we don’t see funerals or memorial services very often. But, of course, there were occasional deaths and the associated memorial services—which were held in place of funerals because the deceased was sent back “home” for a funeral. Some elements of our every day lives are so mundane, that we never think to record anything about them. How many of us burden our diaries and journals with the details of our daily commute? Which route we took, whether the light at a particular street was red or green that day and what car we owned at the time just don’t seem like important details. But more than 100 years later these details sometimes make a lot of difference in how we understand the past. Do you record the details of sacrament meetings in your journal? Has it ever occurred to you that 100 years in the future sacrament meeting might be somewhat different? Fortunately, outsiders sometimes see the mundane of our lives with different eyes, and their accounts of what is mundane to us and unusual to them are, 100 years later, insightful accounts of important parts of every day lives. Where were Mormon meetings first held in New York City? It depends a lot on what you mean by meetings. Do we count meetings held before the congregation was organized? Should we include the homes and private rooms of members? or only places meant for large groups? Do we include where members met privately? or only meetings open to the public? What Happened to the Hornerstown Mormons? Today, LDS congregations in New York City experience a lot of turnover. People move in and out of LDS congregations frequently, driven by education and economic considerations. And we may not imagine that Mormon congregations in the area experienced the same kind of change over 150 years ago. An 1856 newspaper story about the Hornerstown, New Jersey congregation gives an impression of a group in similar flux, although one that is slowly declining instead of increasing as most Mormon congregations in the area today. Did the New York Branch know baseball? Sunday March the 6th. We drilled as before and through the day we play ball and amuse ourselves the best way we can. It is very cool weather and clothing scarce. The New York Times somehow learned that 25 returning Mormon missionaries had arrived in New York City on March 10th, 1858 and tried to track them down and talk to them. But it is clear that the missionaries didn’t want to talk with the Times’ reporter at all. “The effort to learn any particulars concerning their party; where they had been, how long they had been abroad or even their names, was abortive. 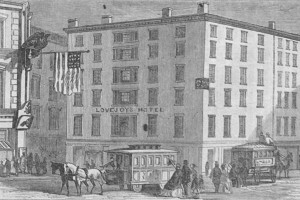 They referred the reporter to Mr. HERRIMAN, whom they designated as their chief, who they thought was at LOVEJOY’S Hotel,” the published report says. But at that hotel the reporter found six missionaries registered, not including Harriman. And, curiously, in signing the register those missionaries didn’t list Salt Lake City as their homes, instead listing Philadelphia, St. Louis and Syracuse. Why were the missionaries so coy? It is wise to take many controversies that appear in the media with a grain of salt, for too often they are gone in a few days, and are regularly based on rumor and innuendo instead of fact. I’m sure that rings true to most of us today. It was certainly true in August of 1866, when a group of Mormon immigrants touched off a minor controversy that appeared in the New York Tribune and then in the Brooklyn Eagle a few days later. The ship Cavour docked at Castle Garden in New York City on July 31, 1866 and almost all its passengers continued their journey by steamer towards Montreal on the following day. From their records, it appears they had no idea of how they would be portrayed in the Tribune a few weeks later.